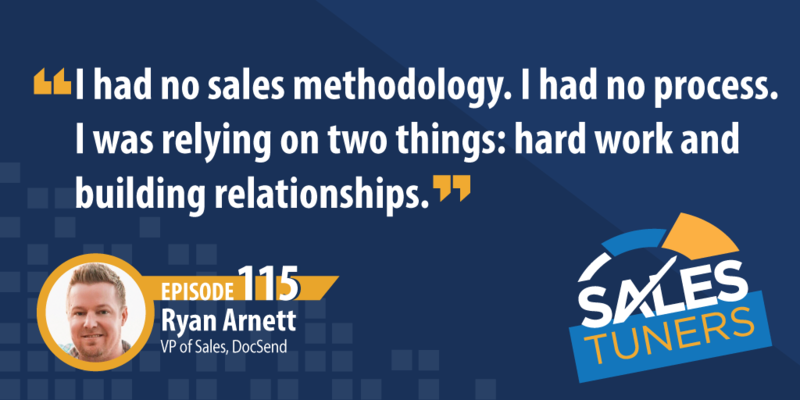 Ryan Arnett (@B2GSaaS) is the Vice President of Sales at DocSend, a deal management application for sales. Ryan has spent more than 10 years leading and scaling sales organization at startups like Meltwater and OpenGov as well as larger companies like Thomson Reuters and Nasdaq. As a former college athlete with a competitive spirit, Ryan stumbled into his first sales position while looking for a career where his hard work would pay off. Unfortunately, it was with a startup company that offered no mentorship, and he was forced to teach himself the ropes. He quickly realized that he didn’t need to be an expert to close deals. All he needed to do was keep picking up the phone and look at every conversation as an opportunity to continue sharpening his skills. Ryan believes one of the biggest mistakes salespeople make is viewing their prospects as buyers. Instead of buyers, he looks at them as people—people he is genuinely interested in getting to know. In this week’s episode, hear how he manages to make this subtle mindset shift and how it leads to a more enjoyable sales experience for everyone involved. It Doesn’t Matter What You Want: There’s nothing that frustrates buyers more than getting cold messages that are all about you. You know the ones I’m talking about… where every paragraph, or maybe even every sentence, starts with “I.” I hope, I just, I wanted, I think, I, I, I, I. Again, it doesn’t matter what you want. Take two minutes to find something personal about the person you’re reaching out to. If for some reason, you can’t find anything, make the message about their situation without making a request of their time. Try asking a question that could start a conversation, instead. There’s No Cookie-Cutter Approach: Similar to Ryan, I’ve studied the majority of different sales methodologies out there. I tend to favor some over others, but I’ve pulled something out of everything I’ve learned and applied it to the relevant situations. I very much liked Ryan’s notion of knowing different methodologies being similar to being able to speak multiple languages. That way, whether you’re prospecting, opening up discovery, doing a demo, or negotiating an enterprise deal, you have the right framework for every step in the process. Mirror Your Customer: How many times has a prospect tried to cut you off in the discovery and said, “just show me the product?” It happens, I get it. My biggest piece of advice for you here is to understand where your lead came from. If it was inbound, understand there may be something specific they’re looking for. Earn the right to ask questions by giving them chunks of content that build a story. If they were an outbound appointment set, realize you still have to get them interested. Maybe that does mean that you have to share more upfront before digging into their needs because they may not fully understand why they’re talking to you. Go the Extra Mile: For the most part, salespeople only do what they’re incentivized to do. If you get paid for hunting new logos, why would you spend your time farming existing clients? Well, to show your buyer you care. While not mandatory, what would happen if you started sitting in the kickoff call with your client success team to be their advocate and making sure they didn’t have to answer all the same questions again? Do you think they’d make introductions to their friends for you? If they left their current company and went somewhere else, do you think they might call you again? Could you imagine retiring your quota without having to do any prospecting?